Arthel Lane “Doc” Watson, recipient of the National Medal of Arts, a National Heritage Fellowship, and eight Grammy Awards (including one for Lifetime Achievement) died on Tuesday, May 29 at Wake Forest Baptist Medical Center in Winston-Salem, NC following abdominal surgery last week. He was 89. 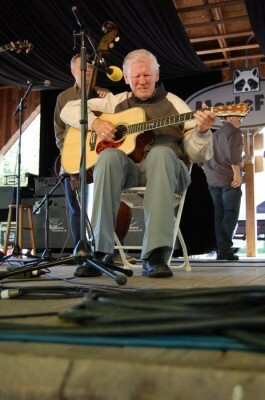 Doc Watson was born in Deep Gap, North Carolina on March 3, 1923, into a family already rich in musical tradition. His mother, Annie Watson, sang traditional secular and religious songs, and his father, General Watson, played the banjo, which was Doc’s first instrument as well. At age thirteen he taught himself the chords to “When the Roses Bloom in Dixieland” on a borrowed guitar, and his delighted father bought him a $12 Stella. He later picked up some chords from a fellow student at the Raleigh (NC) School for the Blind, and began to incorporate material that he heard on records and the radio with the music of his heritage. Back home he played mostly with neighbors and family, among them fiddler Gaither Carlton, who became his father-in-law when Doc married Rosa Lee Carlton in 1947. They had two children, Eddy Merle (named for two of Doc’s idols, country stars Eddy Arnold and Merle Travis) and Nancy Ellen. In 1953 Doc met Jack Williams, a local piano player, and began to play gigs for money. Doc stayed with Williams’ rockabilly/swing band for seven years, a period and a style that he later revisited in the album Docabilly. But he also continued to play acoustic traditional music with his family and with his banjo playing neighbor, Clarence Tom” Ashley. In 1960, spurred by the growing folk revival, folklorists Ralph Rinzler and Eugene Earle came south to record Ashley, and heard Doc Watson in the process. These sessions resulted in Doc’s first recordings, Old-Time Music at Clarence Ashley’s. In 1961 the Friends of Old-Time Music invited Doc, Ashley, Clint Howard and Fred Price to perform at a now-legendary concert in New York City, and one year later Doc gave his first solo performance at Gerde’s Folk City in Greenwich Village. From then on, he was a full-time professional, playing a wide range of concerts, clubs, colleges and festivals, including the Newport Folk Festival and Carnegie Hall. By 1964 he had recorded his eponymous first solo album, and was represented by Folklore Productions, a relationship that continued until his death. In the late 1960s, Doc was joined on the road by his son Merle, who provided both musical and emotional companionship; with Merle playing guitar and banjo and serving as partner and driver, the father-son team expanded their audience nationwide. After working for a while with the band Frosty Morn, they continued to tour with bassist T. Michael Coleman, and brought their music to Europe, Japan and Africa. A series of remarkable recordings, including collaborations with Flatt & Scruggs, Chet Atkins and the Nitty Gritty Dirt Band, helped make Watson the gold standard among traditional pickers. Although he briefly stopped performing after Merle died in a 1985 tractor accident, Doc (accompanied by his grandson Richard Watson and guitarist Jack Lawrence soon resumed a full-time recording and touring schedule. He later teamed with banjoist David Holt, and the two shared a Grammy in 2002 for Legacy. In 2003 Doc reunited with Earl Scruggs and mandolinist Ricky Skaggs to film The Three Pickers, telecast on PBS. During his long career he recorded over fifty albums, many of which are still in print today. Private funeral arrangements are pending.